This is a Big King Cowboy Western Wade Ranch Working Roping Saddle by Hilason. It is reinforced at all pressure points for added durability. As any quality wade roping saddle, it has a deep seat and the fenders hang in a straight position, ensuring the rider can be upright and well-balanced when ready to rope. The seat is uniquely designed to give all the grip and durability required in roping. 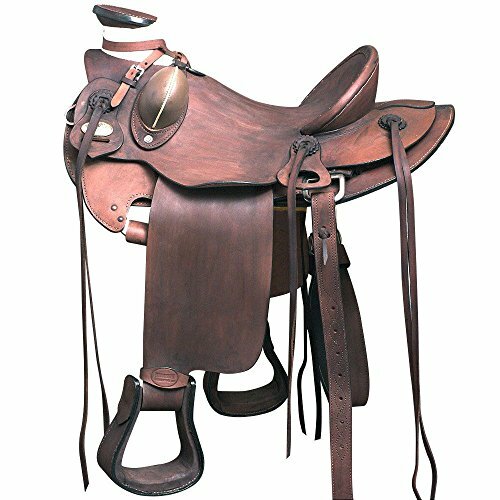 Typical usage of this saddle wil be on the ranch for roping or ranch pasture riding. The pictures elaborate the quality, construction and other details quite clearly. Please feel free to message us for any more details or pictures that you might need. It comes with the complete package as shown in the picture. NOTE:- HILASON now to get a custom saddle of your choice! LEATHER : Premium Grade Genuine Skirting Leather. SADDLE COLOR : Oiled Rustic Walnut Black. TREE : Super Strong Tree. Specially Designed for Heavy Duty works. SEAT : 15" Sleek Leather Seat.